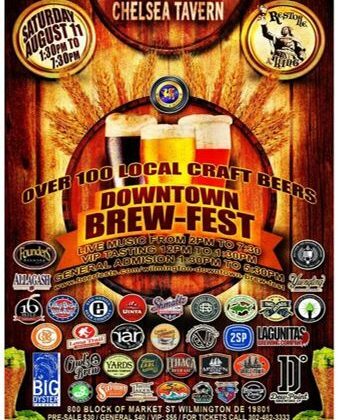 WILMINGTON, DE, July 18, 2018 – For the second consecutive year, Wilmington’s Downtown Brew-Fest returns to the 800 block of North Market Street on Saturday, August 11 from noon until 7:30 p.m. Last year’s inaugural Brew-Fest was an unqualified success. Not only was a good time had by attendees, but the event raised money for Restore the King, the campaign to renovate Delaware’s King Gambrinus statue. A Brew-Fest admission ticket includes beer samples from among more than 100 beers, representing more than 50 breweries. In addition, live music will be provided by three local acts and two DJs. Food will be available for purchase on site from two food trucks and 11 area restaurants. VIP admission includes early event entry, special brews and beer-friendly finger foods served in the VIP area, and free LYFT incentives. The event will also feature a homebrew competition. Participants are encouraged to contact Briana Gordon at Chelsea Tavern for details at (302) 482-3333. Proceeds from Downtown Brew-Fest will again benefit Restore the King. Tickets can be purchased online at https://tickets.beerfests.com/event/wilmington-downtown-brew-fest. VIP admission (12:00-7:30 entry) is $55 and general admission (1:30-7:30 entry) is $40.